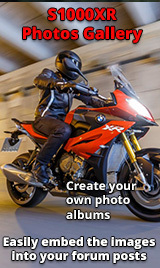 I’m considering a PCP on a new SXR and was wondering what members experiences were when it came to the end of the deal. Did the value of the bike give you you’re deposit back to contribute to a new bike ? I thinking of putting £2k up front but I’m not sure if it’ll disappear when I come to change. I suppose it really depends on how often you want to change your bike. I agree with Wayne you probably will have to add something to the deposit. But I cannot say as I have never purchased on PCP. I have not purchased a new bike, for several years now, as I can buy a nearly new one for a very reduced price on new. If you spend some time looking, at used bikes you will find lots of extremely low mileage examples about, many with all of the bells and whistles already on them. In fact my present XR on a 15 plate, had only 1470 miles on the clock, it included BMW panniers + satnav. It was priced at £9500. I part exchanged my Z1000SX £6800.00 . So payed the balance of £2700, For me that works out a cheaper option. But then I am not worried about being its first owner, and as I have said you can pick up absolute bargain Low mileage bikes if you shop around. But I would agree if you want a new bike. Then PCP is an affordable way to Buy. Just do your homework well and work out all of your options, including how much you will have to dish out when it comes to changing. I’m interested in a new or a BMW approved mainly for the warranty, both come with a 24 months which is very appealing. I’ve had a FaultyStrada before and the S1000XR does appear to have few problems which maybe costly to fix, hence I want the warranty. I must admit to being mystified as to what the few problems appear to be. I am certainly not aware of any major problems with this bike. And certainly unaware of any reoccurring costly fixes. Perhaps you could enlighten us as to what you are referring to. Cooper Motorrad at Bolden are offering a 2k deposit contribution on a few bikes including the XR at the minute, might be worth a look at that, might give you some wiggle on a new bike in couple years? Sounds interesting - I took one out on a test ride last week from Cooper Boldon (Sunderland) but they didn’t mention it. Early negotiation stages I guess.